I hold this property trust in my ISA and in the past year it has also been added it to my Sipp drawdown portfolio. At the end of April the largest geographic exposure was the 43% weighting in the UK, with France making up a further 17%, Sweden 10% and Germany 25%. Retail and office space accounted for 26% and 32% respectively, with another 32% in residential and the remainder divided between industrials and diversified. The main investment areas are shopping centres, residential property in Germany and offices in London’s West End. The trust has today published results for the full year to end March 2018 (link via Investegate). Net assets total return have increased by 15.5% (previous year 8.0%) and share price by 25.5% due to a narrowing of the discount. "It has been a very good year for the Trust. Performance has been strong in both absolute and relative terms and we have enjoyed healthy revenue growth. In November I noted that we remained positive about the merits of property as an income generating asset class and that we were focused on high quality businesses with strong recurring cashflows. Six months on, that statement remains valid but subject to heightened vigilance. The level of divergence between those businesses with growth prospects and those without continues to widen and the advantage of being able to consistently reduce the cost of debt is coming to an end. Real estate continues to provide an income advantage particularly when compared to prevailing bond yields. Our manager is focusing on businesses in areas and sectors which provide the prospect of rental growth, combined with sustainable debt levels. Therefore, with the caveats referred to above, we remain confident of the attributes of the asset class". Revenues have increased by 16% and as a result the final dividend will be increased to 7.55p (last year 6.4p) making a total of 12.2p for the year, an increase of 16% compared to the previous year 10.5p. This gives a yield of 3.0% at the current price of 411p. In contrast to the fortunes of HICL which was added around the same time, this trust has so far been a very positive addition to my portfolio - the share price is up 40% on my purchase price at the end of 2016, plus the dividend has increased by 46%. Obviously I am delighted with my returns over the past 18 months since purchase. I do not however expect this performance to continue at the same pace and the next year or two will be mainly dominated by the Brexit negotiations so I expect a little volatility in the share price but the income seems fairly secure and I am happy to continue and will be looking to add to my holdings on any significant pull-back in the price. This large infrastructure trust was added to my ISA portfolio in December 2016. 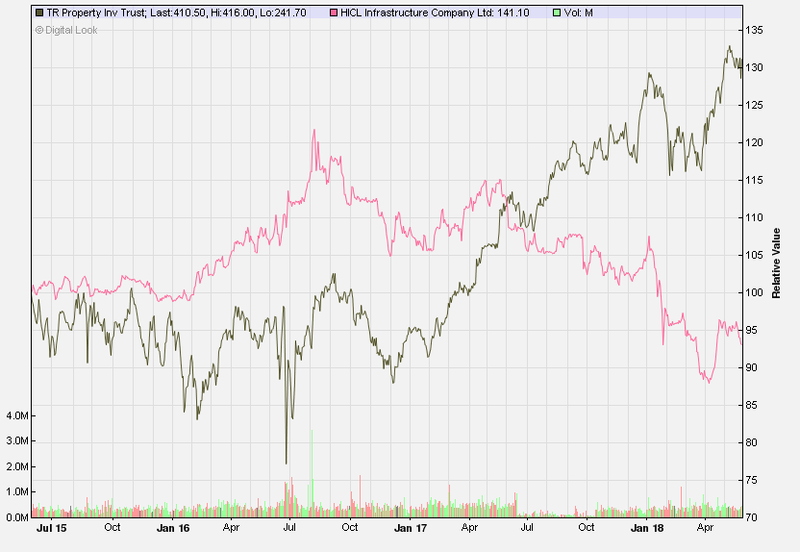 HICL is the largest trust in the infrastructure sector with current assets approaching £2.8bn. 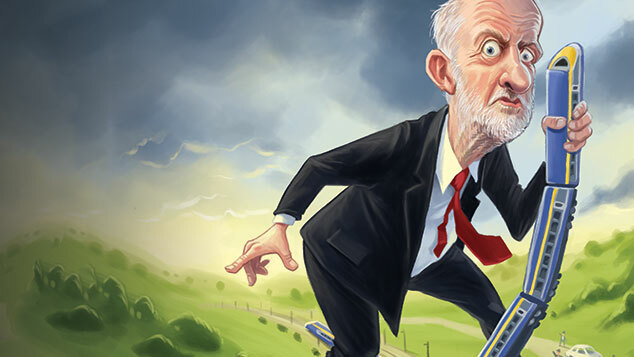 Since purchase, the trust’s shares reacted badly to Labour’s talk of nationalisation at the their Conference last September, when John McDonnell, the shadow chancellor who says his aim is to overthrow capitalism, suggested that a future Labour government would bring existing private finance initiative contracts back under direct public-sector control. McDonnell has also vowed to nationalise rail, water, energy and Royal Mail, with compensation likely to be paid in government bonds. He subsequently said some PFI investors might not be receive full compensation. The share price took a further hit following the collapse of Carillion, with which it had more links than other infrastructure trusts. The share price has retreated from a high of 170p when it traded at a premium to underlying assets and now trades at a discount to net assets but offers a higher yield. The managers aim to raise annual dividends from 7.85p this year to 8.05p next year and 8.25p for the year to March 2020. They have today announced results for the full year to end March 2018. Total net asset return for the period is 5.7% and the portfolio of assets has increased 16% from £2.4bn to £2.8bn. The company have suffered a £60m hit from the collapse of Carillion and as a result profits are down to £122m compared to £177 last year. Likewise, earnings per share are reduced to 6.9p (2017 12.4p) which does not cover full year dividend of 7.85p. The proposed increase for the coming year is 8.05p which gives a fwd yield of 5.5% based on the current share price. "The delivery of long-term, stable income from a diversified portfolio of infrastructure investments has been at the heart of HICL's investment proposition since its inception. As in previous years, the Company has focused on executing its business model and I am pleased to present a resilient set of results for the year. However, the financial year to 31 March 2018 witnessed a combination of external factors that adversely impacted the wider sector, together with some challenges specifically within the HICL portfolio. As a consequence, the Company's share price fell materially in the second half of the year, and the Company's shares traded at a discount to Net Asset Value ("NAV") per share from January 2018 through the final quarter, rather than at a premium as the market has become accustomed. From IPO in March 2006 to 31 March 2018, the Company has delivered a TR of 9.3% p.a. based on dividends paid and the growth in NAV per share. This compares favourably to the Company's long-term target of 7-8% per annum. Further guidance was given in the Company's February 2017 prospectus, being a target long-term return of 5.6% p.a. 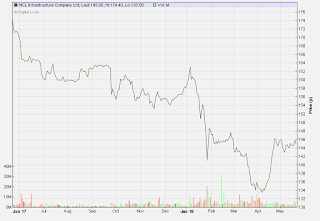 based on an issue price of 159p per share." The share price is obviously sensitive to the threats of an incoming Corbyn government. I believe this is unlikely but it remains a possibility so until that cloud evaporates, I am not expecting the shares to recover much of the ground lost over the past few months. In the present climate I would not be looking to add to my current holding, however I will continue to hold and collect my income. Hopefully down the line the political threats will diminish and the share price rebound to a premium. The shares are down 10% on my purchase price of 162p however the dividends have gone some way to mitigate losses...fingers crossed there will be no more surprises like Carillion over the coming year. It is now three years on since my initial purchase of this all-in-one fund in May 2015 so time for another annual update. I believe the average investor could do well from adopting a very simple, no-frills low cost diy strategy which makes sense, which can be tailored to fit in with a variety of attitudes to risk/market volatility and has every chance of providing a decent outcome. The Vanguard LifeStrategy funds offer a balanced portfolio of globally diversified equities combined with some gilts and corporate bonds. You are invested in 11 industrial sectors and 12 different types of investment, 17 specialist funds, spread across 25 countries and some 18,000 individual shares and bonds. Therefore, by holding just a single LifeStrategy fund, your portfolio is widely diverse with over 18,000 stocks/bonds from all around the world. The bond element (assuming you do not want the 100% equity) will comprise a combination of UK gilts, global bonds, corporate bonds and inflation-linked gilts. 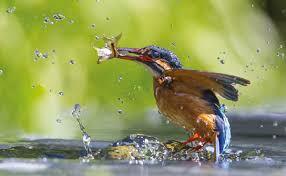 The equities element includes their UK all share tracker, global funds and some exposure to emerging markets. The big advantage for me is the auto rebalance to ensure the fund always remains at the risk level selected at the start - in my case with VLS60, 60% equities. The fund is frequently rebalanced - possibly daily. So, how has the fund performed? I made my initial purchase in my ISA with Halifax Share Dealing in May 2015. My average purchase price was £136.50. The current price is £178.67 which is a gain of 5.4% over the past year and three years on is up by 30.9%. This is an average annualised increase of 9.4% p.a. 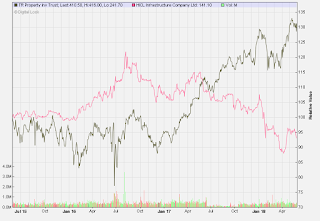 By comparison, the total return for the FTSE All Share over the same period is around 20% so the combination of 40% bonds and a wider exposure to global equities in the VLS fund is working very well so far. Of course, the bonds provide a much less volatile ride compared to a fund with just equities which makes it easier to remain invested. 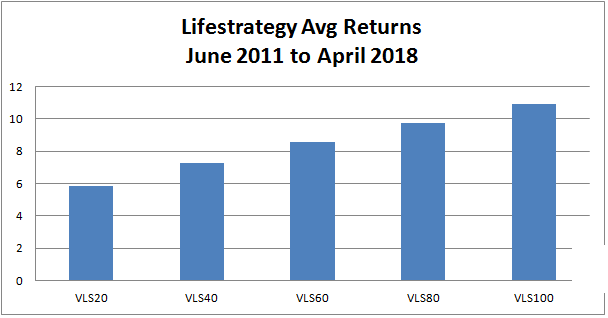 As I am not the type of person who can handle too much volatility, this fund (and my recent addition of the VLS 40) help me to stay invested and this is why they represent the core of my portfolio. The natural yield on the fund is ~1.4% however I really need an income from my investments of around 4%. I have purchased the accumulation version of the fund with the intention of selling off units each year to provide the 'income' I require. In 2016 I actually sold 8% of my holding due to the one-off boost from the fall in sterling post June 23rd and this has provided my income for the past two years. This year I will sell off a further 4% from the 8.6% rise in 2017 - so far I have not needed to dip into the cash buffer. Scottish Mortgage is an actively managed, low cost investment trust, investing in a high conviction, global portfolio of companies. The managers aim to achieve a greater return than the FTSE All World Index (in sterling terms) over a five year rolling period. This investment trust was added to my SIPP portfolio at the start of 2017 at the initial purchase at 338p. A year later, following a little turbulence in the share price, I added SMT to my ISA portfolio at 415p. 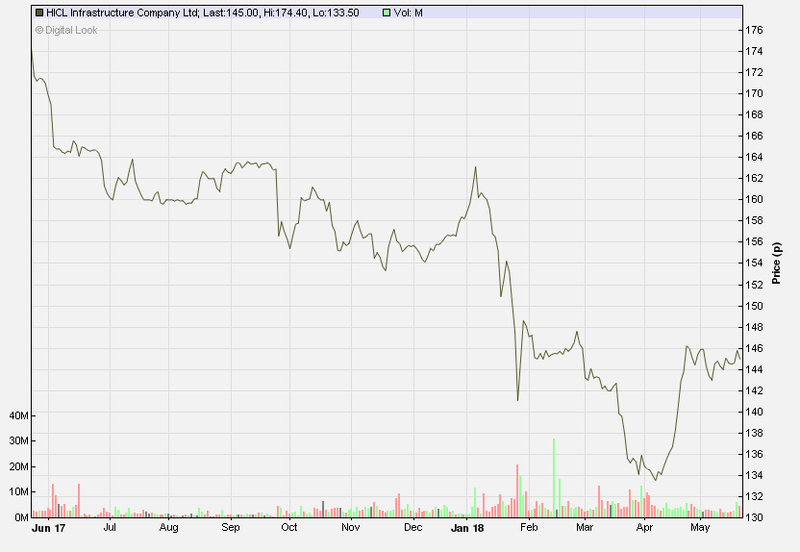 The share price has advanced to currently 505p. The trust has today issued results for the full year to end March 2018 (link via Investegate). 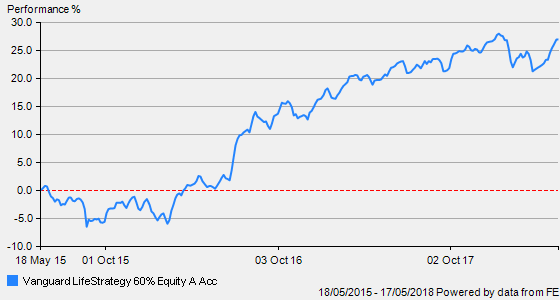 Share price total return for the past year is up 21.6% compared to just 2.9% for the benchmark FTSE All-World index. Scottish Mortgage has increased total net assets to more than £6bn making it one of the UK's largest investment trusts. In 2017 it was promoted to become the only investment trust to be listed in the FTSE 100. 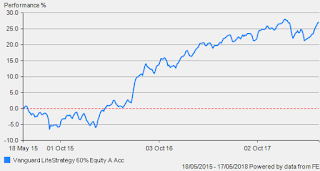 The managers, James Anderson and Tom Slater run a conviction portfolio of around 70 to 80 shares. The result is a portfolio dominated by big holdings in some of the companies involved in the world of social media, the internet, healthcare, eco-friendly energy and gene therapy. The top ten holdings account for 53% of the portfolio and include Amazon 9.9%, Tencent 7.5%, Baidu 4.0% (China's equivalent of Google), Alibaba 7.5%, Tesla Motors 4.9% and Illumina 6.5%. Some 10% of the portfolio is invested in unquoted companies - Dropbox, peer-to-peer lender Funding Circle and airbnb to name three I am familiar with. Slater is convinced that Amazon, its single biggest position in the portfolio, remains an ‘absolutely massive’ opportunity despite a five-year share price rise of 370%. He points out that the $100 bn retail sales it generated in the US last year was under 2% of the market and less than a third of retailing colossus Wal-Mart. Yet it was catching up with huge investment in deliveries leaving its traditional rivals in the dust. Slater highlighted four areas where Amazon had demonstrated its huge growth potential in 2017: US fashion, food, India and web services. In fashion the e-commerce giant forced Nike to cut a deal and start selling its trainers and clothes through Amazon, wiping $1 bn off the shares of sports retailers when the tie-up was announced in June. That was nothing to the $20 bn knocked off grocery stocks with Amazon’s unexpected acquisition of Whole Foods in the same month. In India, Amazon had showed it had learned from its difficult experience in China and quickly established market leadership, much to the discomfort of its local rival, Flipkart, one of the smaller unlisted positions that Scottish Mortgage has established in the past three years. Meanwhile, the potential scale of Amazon Web Services was growing all the time as companies moved their computing operations to the Cloud. ‘This is more of a winner-takes-all market than we previously assumed’ said Slater. One of the questions investment legend and hedge fund manager Seth Klarman would ask of any fund manager is 'did you hold your nerve during the market turmoil of 2008/09'? Some 22% of the trust's portfolio are allocated to China. China's economy is growing at a rapid pace as it becomes increasingly consumer-led. It is now the second largest economy in the world behind USA and has been the largest contributor to global growth since the meltdown of 2008. Annual growth is averaging 7% each year and over just the past 10 years, real terms household income has increased by 120% and more and more of the huge population of 1.3bn continue spending (and also saving). Tencent, the Chinese internet giant behind the WeChat messaging app (over 1bn users), has surpassed Facebook in value after it became the first company in China to be worth more than $500bn. In addition it is a major shareholder in the US social media group Snap. 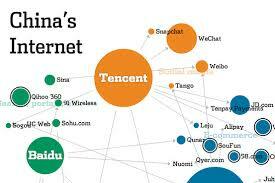 It has now become the world's fifth-most valuable listed company, disrupting the hegemony of the US tech giants. 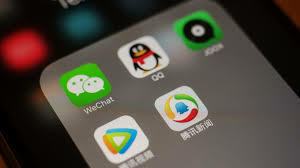 Tencent is little known as a consumer name in the West but its WeChat app dominates in China, where Facebook, Twitter and Google are banned. Baidu is China's leading search engine and has recently started selling 'smart home' products similar to Amazon's Echo/Alexa as well as a personal robot marketed as 'Raven'. They are also looking at more ambitious technology such as driverless cars.. Many of the companies held in the trust's portfolio are disrupting the traditional ways of doing business. 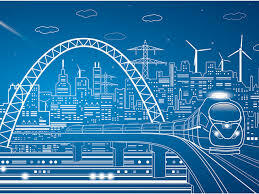 They create new markets or impact significant changes on old markets in a wide range of industries such as auto, health, advertising, retail and manufacturing which are transformed by advances in the technological revolution. Over the past ten years, the trust has delivered a return of 334%. Although this is essentially a global growth trust, it is worth noting it has increased its dividend every year for the past 34 years. Income from the underlying holdings no longer covers the dividend so the board have agreed to provide the difference from capital to continue the progressive pay out. The increase this year will be 2% making a total of 3.07p. However, due to the significant share price appreciation, the current yield is 0.7%. Further, the ongoing charges have been reduced and have fallen from 0.44% to 0.37% which makes it one of the most competitive trusts on offer. Obviously I am pleased with progress since my purchases - 50% SIPP and 22% ISA.... I am just sorry I did not purchase earlier. 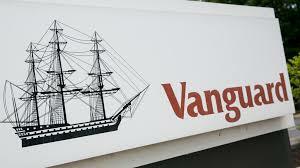 This actively managed investment is one of the satellites which complement my core passive index holdings comprising mainly Vanguard Lifestrategy 60 & 40. I have also recently started an investment savings plan for my grandchildren using this trust via Baillie Gifford. The opening lump sum has gained 15% in the past month so we are off to a good start. For now the current holdings can return to the bottom drawer.